Prenup engagement photos have become very popular these days -- so much so that almost all couples have made it a must-do before their wedding and those of us that love country take the cake with creativity! 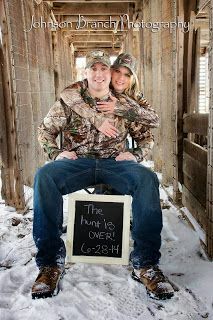 Hands down "The Hunt is Over" and outdoor/camo themed engagement photos are the best, most creative keepsake memories. Talk about being unique and putting the smack down on tradition! It's actually a great way to make wonderful and lasting memories with your partner because this process allows you to bond and have fun together. Having an engagement shoot before the wedding shoot helps get you camera-ready and more comfortable for the big day too. Your wedding photographer will also have the chance to familiarize himself/herself with your best angles so that he can capture them perfectly. Another important reason for the prenup shoot is to produce amazing save-the-date photos you can share with family and friends whom you intend to invite to the wedding. It also allows the guests to get to know who you are as a couple and what you love doing. This is a themed shoot where you can freely express your love for each other and show off your creativity. Now that we've given you good reasons to take the time to prepare and enjoy the engagement photo process, let's get right on to the theme. Since you're reading our blog, we presume you love camo, country, hunting, and/or the outdoors and you're thinking of a theme along those lines. Heck! It's in your blood, right? 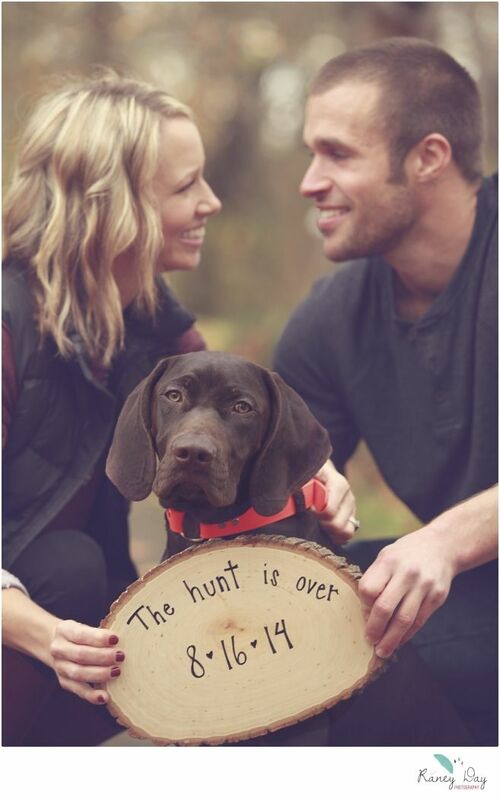 We highly encourage you to break tradition, wear what you love, and add a kick of camo to the engagement photos you plan. 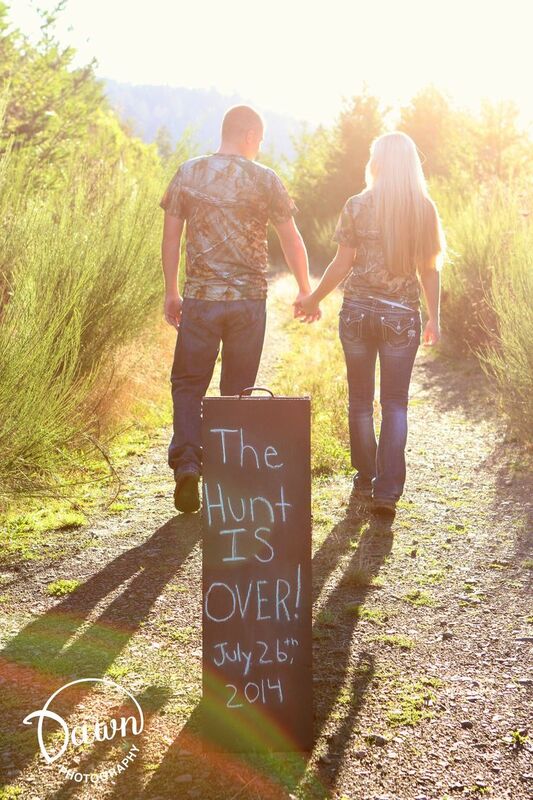 Don't you think "The Hunt is Over" photos would go nicely with your wedding plans? 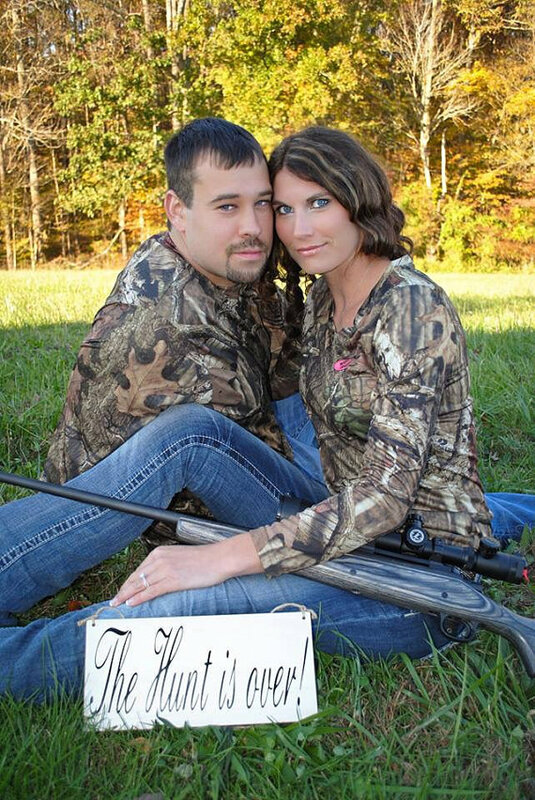 Camokix, the leading source for camo rings and country wedding accessories, has compiled some of the best "The Hunt is Over" engagement photos found on Pinterest. We hope this roundup inspires you! (Be sure to check out the photographers too in case one is in your area or is willing to travel...they're obviously awesome). 1. Couples are outfitted in camo. You can opt to have matching camo outfits. The picture below shows a couple that matched everything, from head to toe. Or only your man can wear camo if you'd rather wear a dainty dress or some other cute country girl outfit. 2. 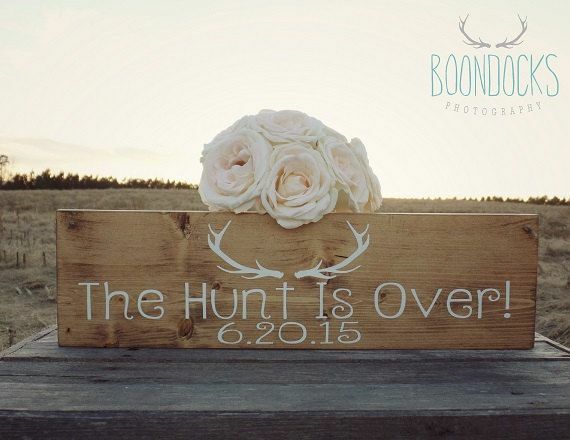 Use chalk or wood signs and write down "The Hunt is Over" together with the wedding date. This sign can be used again as part of the decorations on your wedding day. You can even hang or display it in your home years to come. If you want a more rugged sign, try using real antlers! 3. If you're a hunter, have your favorite guns or bows and arrows in hand. Your props should represent who you are and what you're passionate about. You can even have your dog included in the picture. 4. Have a fun gimmick showing how and why the hunt is over! For this picture, you can act out a scene wherein you caught your partner. You can do it any way you like. Try to think out-of-the-box and have fun with it! We hope these pictures have inspired you and given you ideas on what to do with your "Hunt is Over" prenup shoot! Remember to have fun doing it! Pictures are classic and timeless. It's something we can look at to bring us back to that wonderful time and place - a lasting memento of a particular milestone in our lives. So be sure to take lots and lots of pictures!